Swaraj 724 XM tractor price. Swaraj tractors 724 price with mileage, All detailed Information and specifications. HP and Power steering, price list in UP, Punjab, Bihar all over India. The price of Swaraj 724 XM Tractor in India is approx Rs. 416189 (Indian Rupees, Ex Show room Price). Price of Swaraj 724 XM in Gujarat: Rs. 416189 Ex-Showroom. Price of Swaraj 724 XM tractor in Rajasthan: Rs. 416189 Ex-Showroom. 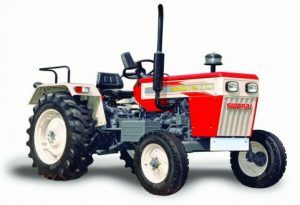 Price of Swaraj 724 XM tractor in Punjab: Rs. 416189 Ex-Showroom. Price of Swaraj 724 XM in Madhya Pradesh: Rs. 416189 Ex-Showroom. Price of Swaraj 724 XM in Maharashtra: Rs. 416189 Ex-Showroom. The Swaraj tractor 724 XM is fallen into 25 to 30 horsepower category tractor with 1824 CC. Features included with Swaraj 724 XM are oil immersed brakes that offer better braking efficiency to the operator and also quick release coupler that provides easiness for connection of tripping trailer. Operators comfort, it is providing mechanical steering and 8 forward and 2 reverse gearboxes, 12v 88 Ah. Fuel capacity of this tractor is 45 litres. Swaraj 724 XM is having a bigger wheelbase of 1935 mm so it makes highly suitable for haulage and agricultural applications like Cultivator, Rotavator, Harvesting, Reaping etc. QRC with Tap off Pipe: It has quick release coupler so it provides easy connection of tripling trailer. Stabilizers Bar: Stabilisers bar can control sway of heavy implements like Rotavator. Steering Lock: For the safety of the operator, Tractor comes with Steering Lock of front axle lock. Straight Front Axle: Axle of Swaraj 724 XM is straight so it provides better stability during haulage application. With Rotavator mini tractor is generating more power so farmers can easily rotavate. Still, PTL is selling tractors in the name of Swaraj Tractors instead of Punjab Tractors. new post about Swaraj tractor 724 XM. All detailed Information and specifications. HP and Power steering, price list in UP, Punjab, Bihar all over India.